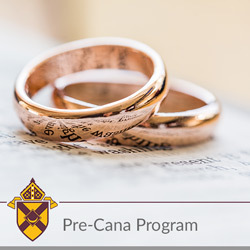 Step One: Meet with your priest or deacon and if you determine online marriage preparation is the way to go, register here. When you purchase the access below, you will be guided through the process of watching and reflecting on videos. After you have watched the videos, you will meet with your priest or deacon to discuss them. Congratulations, again on your engagement. If you need assistance, please contact Katey (Katey.bourne@dor.org) or Don (Donald.smith@dor.org) at the Diocesan Offices. 4-videos and reflections followed by a conversation with the priest or deacon preparing you for marriage in the Catholic Church. Explore the spirituality and sacramentality of marriage and enter into the vocation with God-given grace.